John Deere engines are a great option for your vessel. They are built sturdily and are reliable even in the toughest conditions. If something does need fixing, Diesel Services of America has all of the John Deere marine engine parts that you need to get the job done. John Deere is often thought of as the leader in farming equipment. And while a John Deere tractor is not an uncommon sight, there is way more to the industrial equipment company. While they are more widely known for their farming, construction, and forestry equipment, that is not all that they do. John Deere has also been one of the most reliable marine diesel engine manufacturers in the industry for over 30 years. Read n to find out why Diesel Services of America is the leader in John Deere marine engines parts and services. John Deere marine engines have been known to run anywhere from 5,000 hours to 20,000 hours (!!) before needing an engine overhaul. However, maintenance and small repairs are always essential to keep any engine running at the peak of performance. Diesel Services of America is South Florida and the Caribbean’s leaders in diesel engine maintenance, repair, and overhauls. DSOA is factory authorized to service John Deere engines, so you know that your repairs will be timely and complete. We have a fleet of fully equipped service vehicles for when things go wrong right as you are about to set sail. With our fleet, we can perform dockside maintenance and repairs on your engine. We also have a brick and mortar warehouse with all of the latest equipment needed in order to rigorously test your engine and all of its systems. We ensure a timely turnover when a repair does need to be made. In order to do this, we have an extensive collection of in-stock service parts. We have a number of genuine John Deere replacements as well as parts from other reputable brands such as MAN, Perkins, Kohler, Westerbeke, Volvo Penta, and Phasor Marine. If your engine is on the older side, we have an obsolete and hard to find parts store. Just enter the brand of product that you need and a keyword such as ‘hose’ or ‘filter’ and all of our hard to find parts matching your criteria will show. Now you can repair and use your engine for as long as it will run. 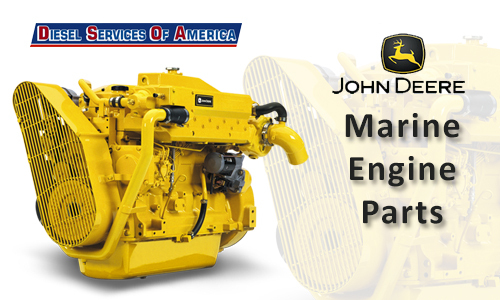 DSOA has all of the John Deere marine engine parts you may need, old or new! Diesel Services of America is proud to Be a MAN, Volvo Penta, and John Deere authorized dealer and to provide South Florida’s best in John Deere marine engine parts and services. We even sell brand new diesel engines and marine generators. We are centrally located at 2501 W State Road 84, Fort Lauderdale, FL 33312. Come in to talk to one of our technicians, set up a maintenance plan, or create a repair appointment. If you don’t live in South Florida, you can give us a call at (954) 781-1464!